Proving that comfort can be compatible with toughness, our top of the line 2015 Chevrolet Silverado 3500 Dually LTZ Crew Cab 4x4, shown in stunning Graystone Metallic, is the ultimate truck for any job. Beneath the One Ton exterior sits our 6.6 Liter Duramax Turbo Diesel that kicks out 397hp while tethered to a 6 Speed Allison 1000 Automatic.This stellar combination ensures that our 4X4 machine can handle a payload up to 7,374lbs and still tow effortlessly with its tow/haul mode. Control and dependability are further augmented by the trailering package and automatic locking rear differential that allow you to tow 23,200lbs! 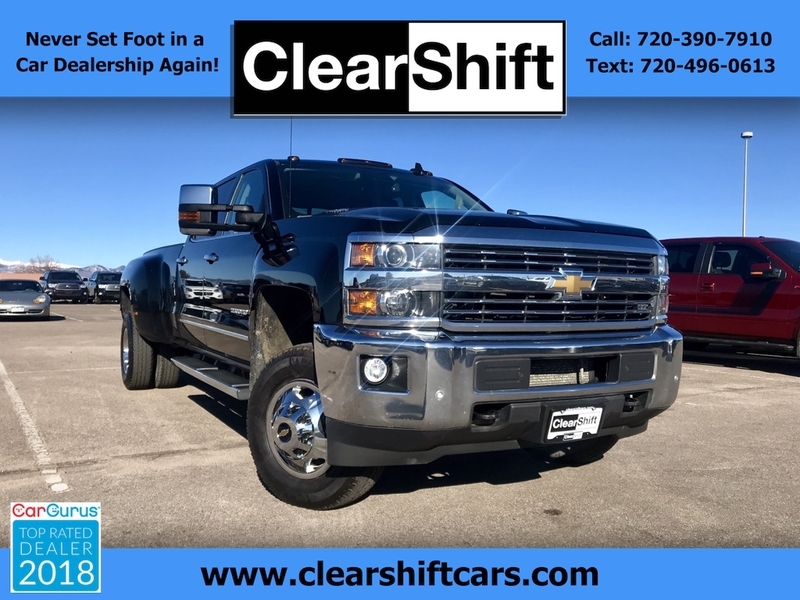 Redesigned for 2015, our Silverado LTZ lets you step out in style and is sure to turn heads with sleek wheels, a distinctive chrome grille and fog lights. The charm continues in the hushed interior that is rich with comfortable leather, heated seats and dual-zone climate control. With the Chevrolet MyLink3 system that features a color touch screen, you'll experience a seamless connection to your digital world; while a remote vehicle starter, Bluetooth and an upgraded sound system help make each ride feel first class. Our new Silverado is the first heavy-duty full-size pickup in its class to offer advanced safety features such as Forward Collision Alert, Lane Departure Warning and the Safety Alert Driver Seat. Reliable, dependable and safe; our capable Silverado 3500 has your back! Get behind the wheel to feel the power. Print this page and call us Now... We Know You Will Enjoy Your Test Drive Towards Ownership! WE SHOW BY APPOINTMENT ONLY! PLEASE CALL OR TEXT (720) 390-7910 NOW TO SCHEDULE! WE ACCEPT ANY TRADE. WE ARRANGE FINANCING WITH ALL MAJOR BANKS AND CREDIT UNIONS. Allison 1000 6-Speed Automatic, 4WD, Jet Black w/Perforated Leather Appointed Seat Trim.